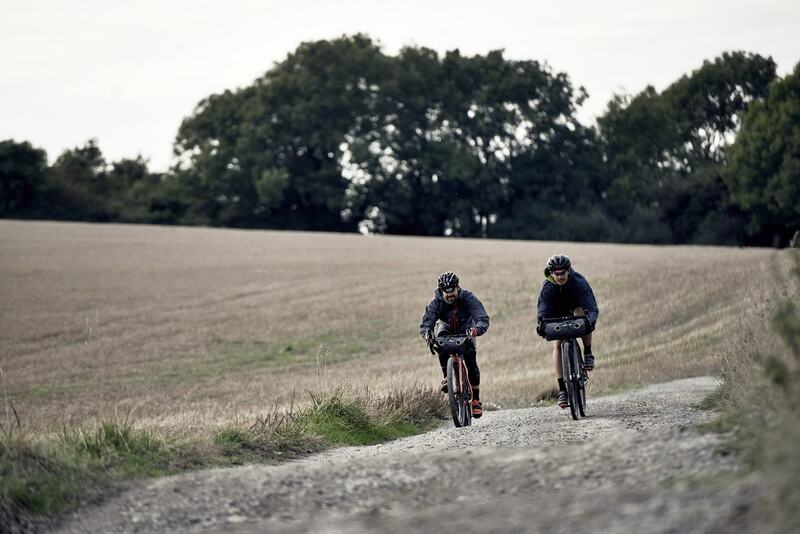 These few words encapsulate the ethos of Dom Mason and the Mason Cycles brand. The current fixation of cycling by numbers and post ride anaylsis is anathema to Dom. I feel he would prefer us to get away from the data driven road we are all following in favour of a return to simply riding for enjoyment. Cycling imagery tends to concentrate on the ‘warrior monk’ or ‘noble suffering’. You can picture the scene. Mud splattered riders at the very limits of their physical resources, collapsed over their bikes, steaming gently as the rain falls around them. We can all empathise with them but is this really what cycling has become? 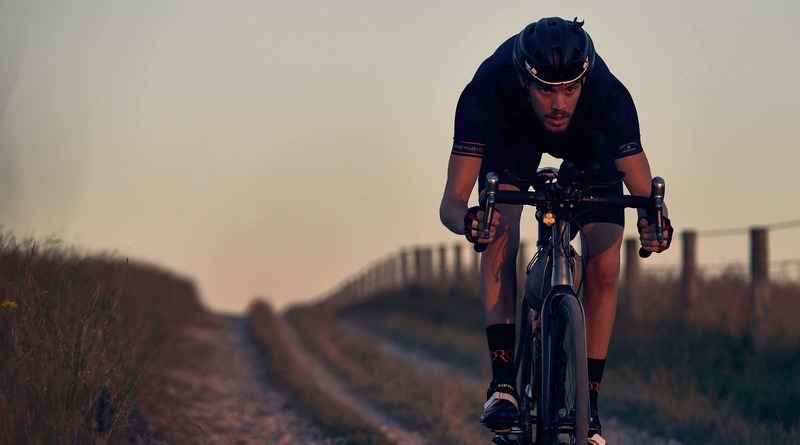 Suffering might play well with some, but not with Dom Mason for whom cycling is all about fun, having a blast, splashing through the mud or the wet and ending up with a grin. We got the impression that Dom is the archetypal ‘driven’ man. Bubbling over with ideas, constantly innovating and looking for new angles, he is a human dynamo. Add his uncompromising demands on quality and you get a glimpse into (this aspect of) his character. 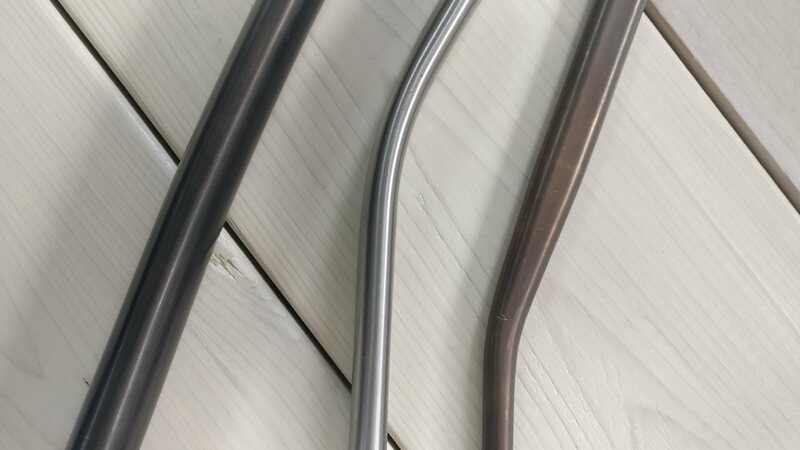 Metal Guru: Dom Mason’s passion for alloy and steel tubing is a refreshing change from the carbon obsessed mainstream. An agricultural engineer by trade, Dom did not follow a traditional route into the bike business. The hands on aspect of his former trade developed into teaching but this was never going to satisfy him for long. Once offered a route into bike design, Dom found his métier and the rest, as they say, is history. A job with Kinesis lasted for 15 years but professional and personal pressures resulted in his leaving to create his own destiny. An important influence on Dom’s bike design is the desire not to conform, to constantly push at boundaries,to explore what is possible. The tentative marriage of disc brakes and road frames was the catalyst he needed to spark the creative drive. The traditional bike industry was, and to an extent still is, fixated on the superiority of the rim brake. Coming from a mountain bike background however, the benefits of a disc brake was nothing new. While still with Kinesis, the MTB influence resulted in the Kinesis Crosslight, a refreshingly new take on the Cyclo Cross format. By fusing the influence of MTB with CX, he managed to turn the design of the long established CX bike on its head. This is where the Mason story began in earnest. Boards and Prototypes: The walls of the Mason Barn are an art exhibition of skateboarding memorabilia and hard ridden development frames. 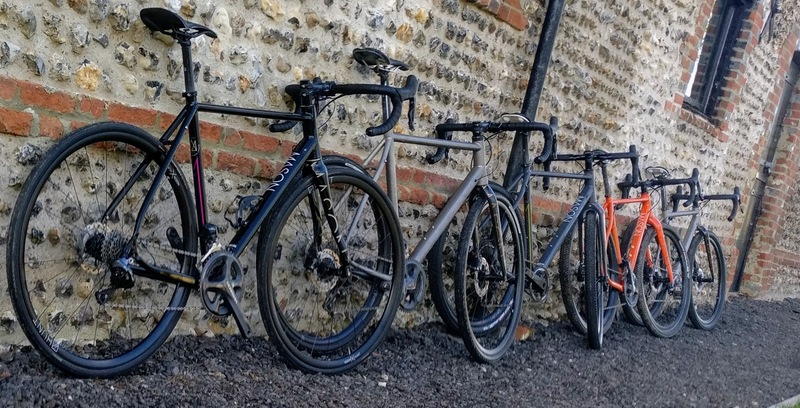 Disc brakes – who’d have thought such a mundane component could turn bike design upside down? Wider tyres, better mud clearance, different geometry and more fun! Bike technology is dynamic but attitudes among the established bicycle industry tend to be either ossified or simply resistant to innovation. 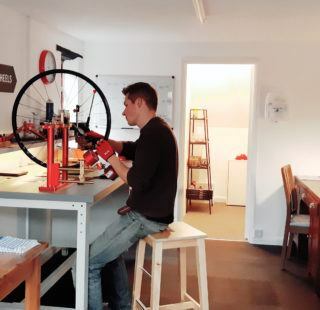 Mason Cycles are small enough to embrace and benefit from this technological dynamism. Larger manufacturers are slower to respond and new ideas only slowly filter though to the production line. Freed from the constraints of ‘big business’, small companies are usually found right at the cutting edge of bike design. And so it is with Mason. You’d have thought that designs like the Bokeh are cutting edge enough but think again. As the 1 x 11 concept gains more popularity for example, so Dom’s ideas have kept pace. A good proportion of the Bokeh and increasing numbers of the road based complete builds leaving the Mason Barn are in the 1×11 format nowadays. Is this the future for all bikes? Practice what you preach: Get out there and have an adventure! 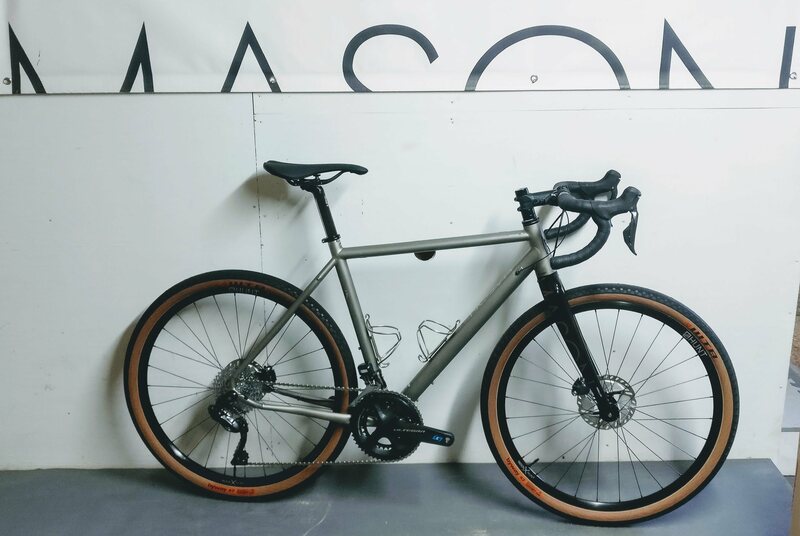 Mason were the first brand to design and take proper “Switchable Routing” into production for performance steel frames for example with their “MultiPort” design. Not that this was easy, but they got there. The trouble with being an innovator is getting component builders to understand and accept your vision. Tubing is a good case in point – and persuading a traditional Italian company to do something completely new can be a thankless and time consuming task. Combining constant innovation with an uncompromising demand for quality does not come cheap. Mason frames are unquestionably a premium product and are testament to one man’s drive and determination to be different. The stunning Bokeh Ti – Finding a partner to build these to Mason’s exacting standards was a challenge. The depth of detail and craftsmanship means that only 3 frames a month can be made. You’ll have to join the waiting list. With the emphasis on high quality craftsmanship there is unlikely to be a carbon Mason. Carbon is not synonymous with low volume, high quality frames. Not only that, the carbon manufacturing process is not environmentally friendly. 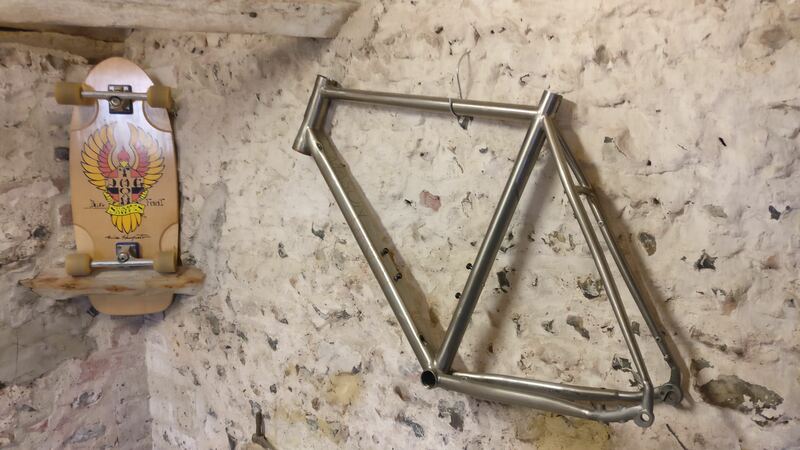 Furthermore, the recycling potential of your average carbon frame is non existent. If you are waiting for a carbon Mason then, don’t hold your breath! So who rides these bikes? Is there a typical customer? Looking at the two road bikes (The aluminium Definition and steel Resolution), typical customers fall into two camps. The long time, serious, cyclist in their late 40’s, early 50s tend to go for the Resolution. Old enough to appreciate the qualities of a steel bike yet open minded enough to appreciate the technological and design innovations associated with the brand. The Mason family. It’s growing. 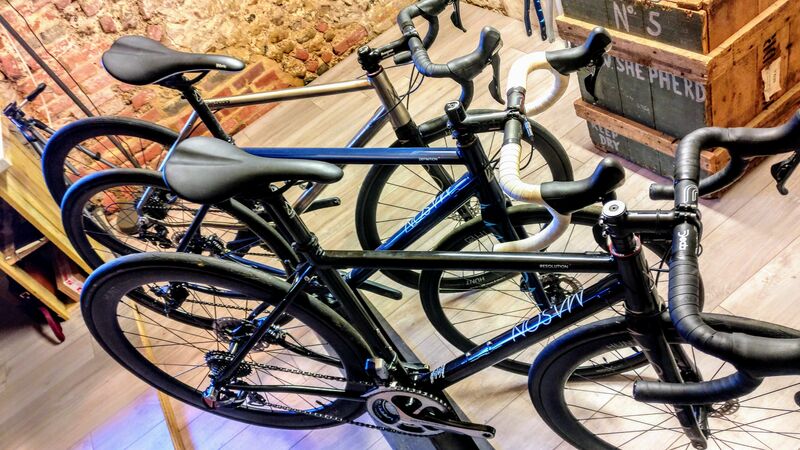 Another group into the Mason road bikes is the new breed of super enthusiastic “30 something” keen on their cycling but equally inspired by the opportunity to turn up for the Sunday club run on something special. None of your mass produced carbon clones here! The Bokeh has a wider appeal. Mountain bikers of all ages looking for a road bike with more than a nod to MTB design are definitely fans. Interestingly, the other group of Bokeh riders is made up of roadies who have finally begun to notice the roadside trails, those little avenues to fun that we pass every day! What about the future? There is something in the pipeline, about which we are sworn to secrecy. All we can say, on pain of having our lips sewn shut forever, is that you need to keep a close eye on Josh Ibbett and his adventures planned for the season ahead. Josh’s ultra-endurance palmares has an undoubted influence on Dom’s design direction. 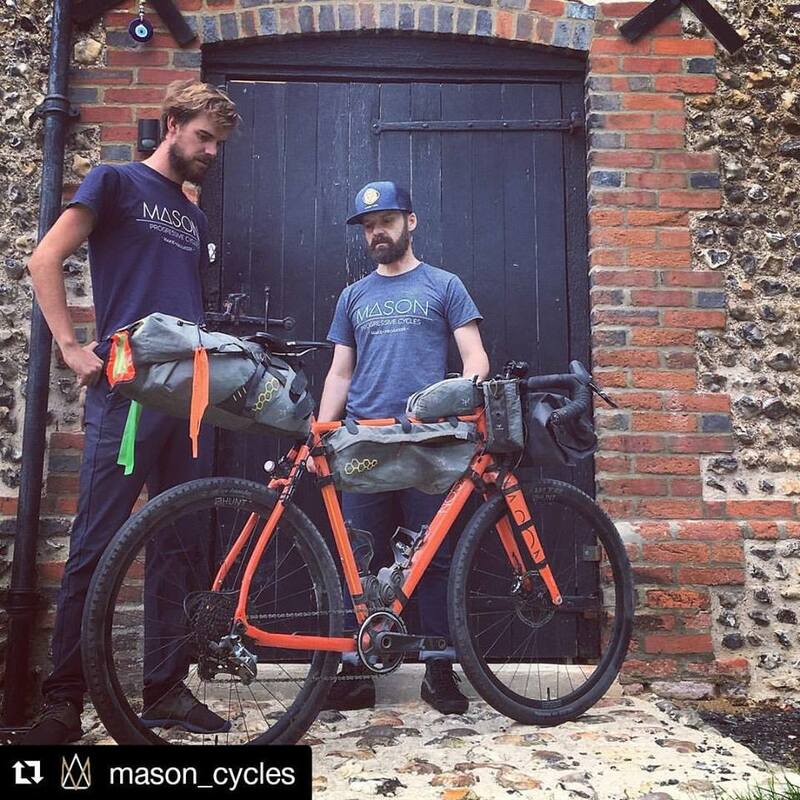 For the Transcontinental Race in 2015, Josh went and fitted the widest tyres possible between the stays of a Mason Definition. 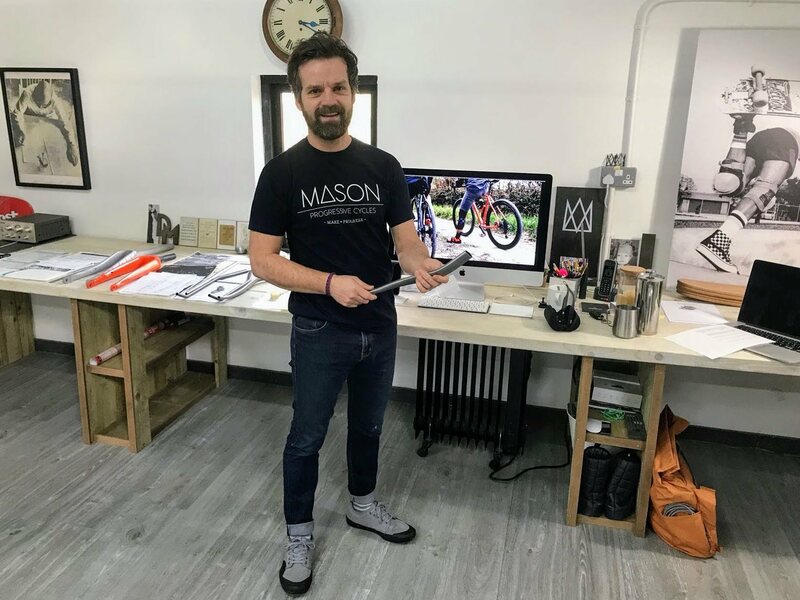 Josh Ibbett’s ultra endurance adventures have been a key influence for the direction of Mason Cycles. The added comfort was perfect for the gruelling challenge across Europe to Istanbul and clearly aided Josh in claiming the win. He was a whole day and 400km ahead of his closest competitor. But according to Josh, the Definition started to find it’s limits over larger rocks when taking to rougher trails on later rides in the Pyrenees. 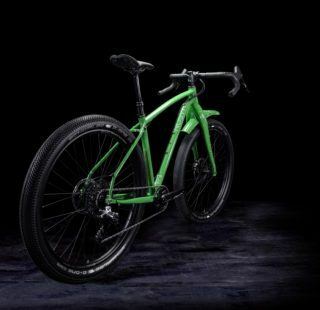 The seed was planted in Dom’s mind for an ‘Adventure Sport’ bike that could take wide tyres, glide effortlessly down roads but also hammer it off-road. The Bokeh was born. Ibbett’s planned activities can only hint at the way things are going. 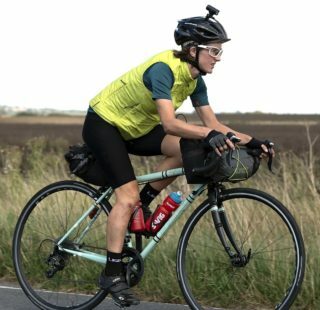 A 1,000km bikepacking race in Oman, the Transatlantic Way and a return to the Italy Divide to protect his 2017 title, feature high on the list. After riding a Mason Bokeh 10,000 miles across Europe, Canada, USA, and Mexico, Josh pops back to compare notes with Dom. Furthermore, the Mason #FastFar motif has developed into Further/Harder/Rougher. 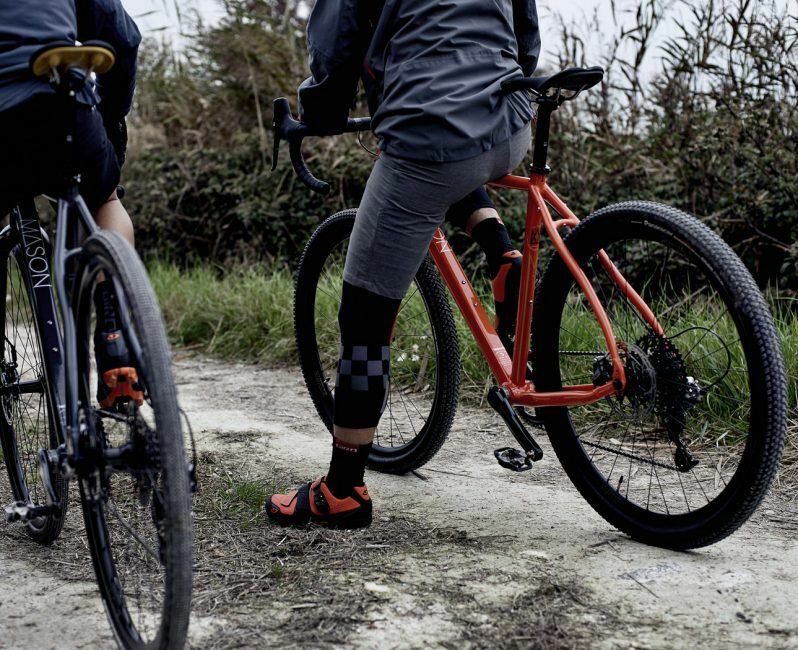 Dom himself is excited by 1x gear systems and the freedom they give a designer, liberating them from the restrictions forced upon frame design by front derailleurs and large chainrings. 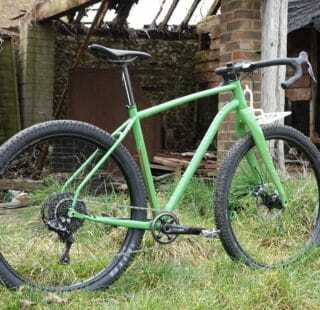 “Start to imagine the chainstay clearance this gives you”. This human dynamo was once again, bubbling with new ideas. Prototype custom tube profiles. A tantalising glance at what the future holds? Little known and quite honestly, under promoted, is the Mason demo fleet. The Mason team are ready and waiting for people to contact them and organise a test ride. Not only do they have bikes for you to try, they have a nice little test loop through the lanes of the South Downs and along the riverbank of the Adur. Customers have come from all over Europe to take a bike out for a spin so what is stopping you? Though it may be an expensive trip; Dom told us that 9 times out of 10, they have a new customer before they’ve even ridden out of the farmyard! Mason are expanding the demo range as they grow so get in touch to see what is available. 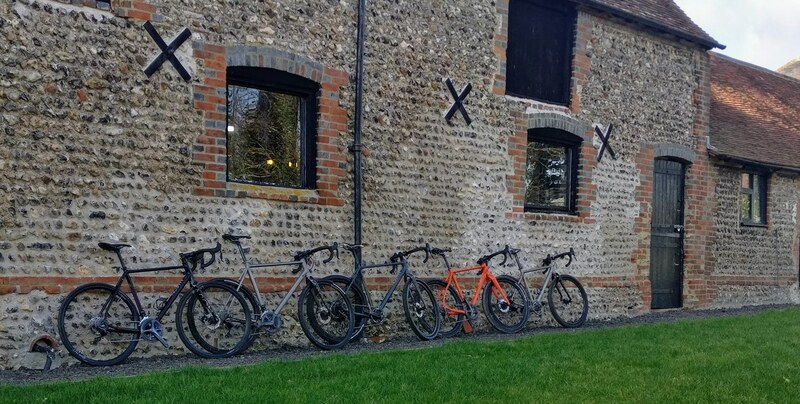 The Mason Barn has a ready supply of demo bikes available. Just drop them a line if you want to try one for yourself. We plan to pay another visit to the Mason Barn some time later this year. Maybe we will see you there.